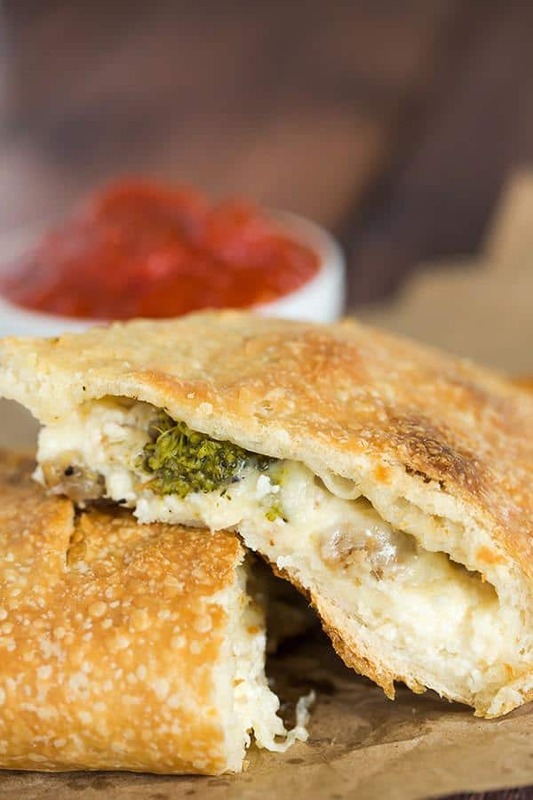 Simple, classic calzones made from an easy pizza dough and with an unlimited assortment of filling possibilities! 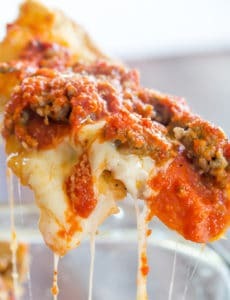 What do you do when you’re umpteen months pregnant and are seriously craving pizza, but sauce is giving you heartburn and you’re staying away from things like pepperoni and sausage? You could get a white pizza, but since I’m not a huge fan of tomatoes, that’s a rather boring option. The better answer? Have a calzone! Calzones became my go-to from our local pizza place when everyone else was eating pizza… lots of pizza dough, TONS of cheese, delicious toppings (I always opted for green peppers and mushrooms), and most importantly… no heartburn-inducing sauce! After eating at least a half dozen of these over the course of my pregnancy, my husband asked if I had ever made them from scratch. I had… once… and my original pizza stone cracked underneath them, womp womp. I was way overdue for a new recipe, so I turned one of our Sunday dinners into a calzone party. 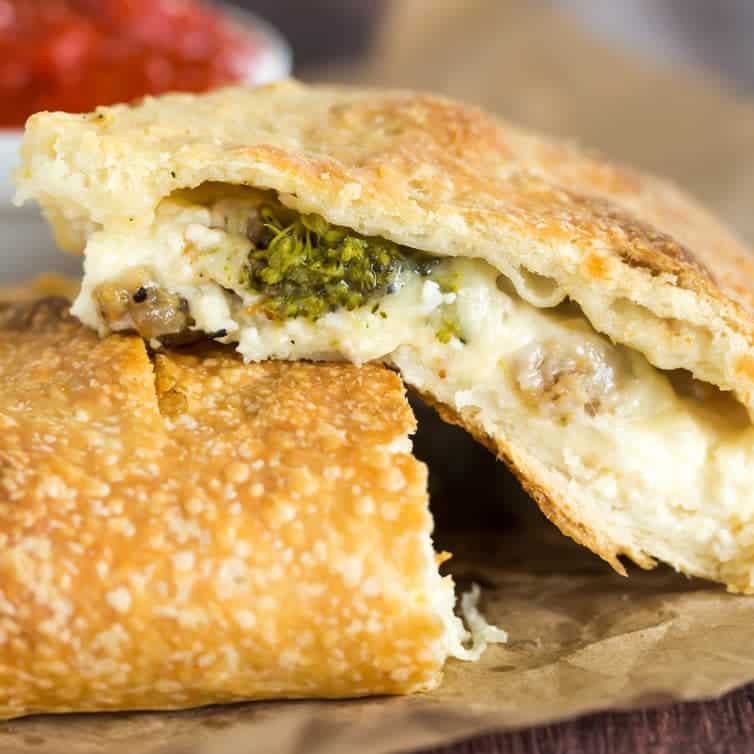 The pizza dough for these calzones is the perfect combination of crisp on the outside, chewy inside, and sturdy enough to hold up to literal mountains of toppings! I also used an obscene amount of cheese because, honestly, can pizza or pizza products ever be too cheesy? I think not. Also important – keeping them organized and labeled so I knew who got which calzone! This was one of the most popular Sunday dinners that we’ve had. Everyone loved this idea and had a blast creating their own personalized calzone. I actually assembled these the night before, covered in plastic wrap and refrigerated, then baked the next day, adding a couple of minutes to the baking time. They turned out perfectly, so making these ahead of time is definitely an option. As much as I enjoyed my summer of calzones (which just made me think of the “summer of George” episode from Seinfeld! ), I was beyond thrilled to dig into a pepperoni pizza with my husband while watching a preseason hockey game from my hospital room a couple of weeks ago. Make the Dough: In the bowl of a standing mixer, whisk together the flour, yeast, and salt to combine. Attach the dough hook and with the mixer running at medium-low speed, add the olive oil, then gradually add the water; continue to mix until mixture comes together and a smooth, elastic dough forms, about 10 minutes. Coat a large bowl with non-stick cooking spray; transfer the ball of dough to the bowl, turn to coat, and cover with plastic wrap. Let rise in a warm, draft-free area until doubled in size, about 1½ to 2 hours. Prepare the Filling: While the dough rises, combine the ricotta cheese, half of the mozzarella and half of the provolone, cover with plastic wrap, and refrigerate until needed. If using any sausage or vegetables for the filling, saute them and place on paper towel-lined plate to drain. Assemble the Calzones: Adjust an oven rack to the lowest position, place a pizza stone on the oven rack, and preheat the oven to 500 degrees. Line a baking sheet with parchment paper and spray the parchment with nonstick cooking spray. Turn the risen dough out onto unfloured work surface. Divide the dough into six equal pieces and gently shape each piece of dough into a ball. Transfer the balls of dough to the baking sheet and cover with plastic wrap lightly sprayed with nonstick cooking spray. Let the dough rest at least 15 minutes, but no more than 30 minutes. Working with one piece of dough at a time, roll into a 9-inch circle. Spread one-sixth of the ricotta mixture on the bottom half of the dough round, leaving a 1-inch boarder. Top with your desired fillings, then top with one-sixth of the remaining mozzarella and provolone cheeses. Fold the top half of the dough over the filled bottom half, leaving a ½-inch layer of the bottom layer uncovered. With your fingertips, lightly press around the cheese filling and out to the edge to lightly seal the dough. Begining at one end of the calzone, place an index finger diagonally across the edge and gently pull the bottom layer of dough over the tip of your index finger; press into dough to seal. Repeat until the calzone is fully sealed. 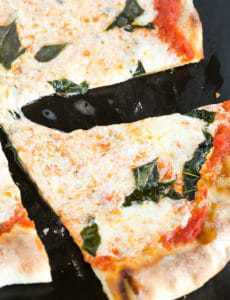 With a paring knife, cut 5 slits, about 1½ inches long, diagonally across the top of the calzone. Repeat with the remaining balls of dough until all of the calzones are assembled. 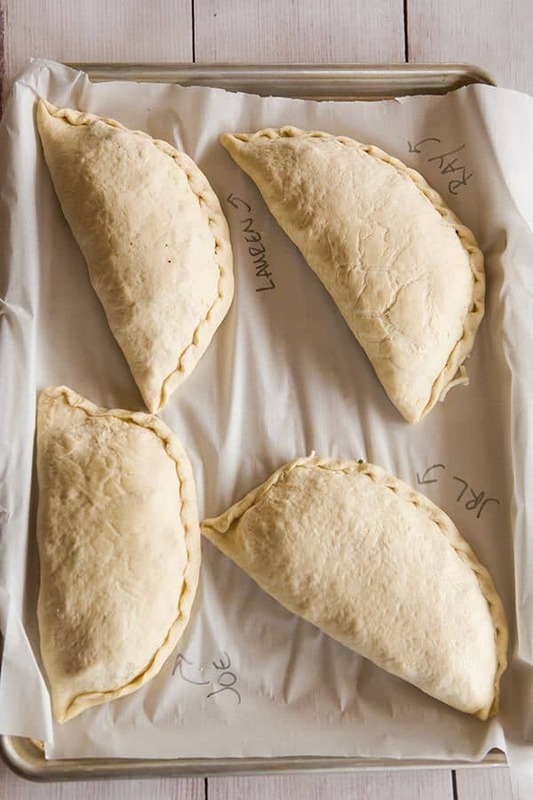 Brush the tops and sides of each of the calzones with olive oil. Dust a pizza peel with flour and transfer three of the calzones to the baking stone. Bake until golden brown, about 11 to 15 minutes. Remove to a wire cooling rack and allow to cool for at least 5 minutes before serving. Once you remove the first batch, bake the second batch of calzones. 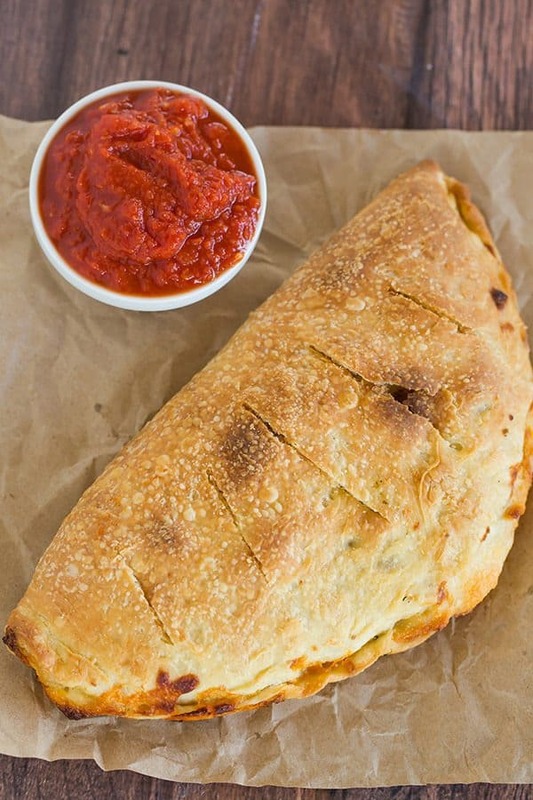 Make the Tomato Dipping Sauce: When you put the first batch of calzones in the oven, start the dipping sauce. Place the garlic and olive oil in a medium saucepan over medium heat. When the garlic starts to sizzle, add the crushed tomatoes. Simmer, uncovered, until the sauce is thickened, about 15 minutes. Season to taste with salt and pepper. CAN I JUST CUT THE DOUGH IN HALF TO MAKE 2 LARGER CALZONES? I WANT TO USE HAM AND SWISS CHEESE,DO I OMIT ANY OF THE OTHER CHEESES? Hi! If you used the leftover dough from the Neapolitan Pizza would you make any other adjustments to this recipe or just switch out the dough portion and start with the dough at room temp and roll out to 9inch? Thank you! A labor of love. Made it for my wife. Daughter and grandkids came over and finished em off. Excellent. Followed recipe nearly completely. Used food processor to make dough and plain non-stick cookie sheet. A lot of work but well worth it. 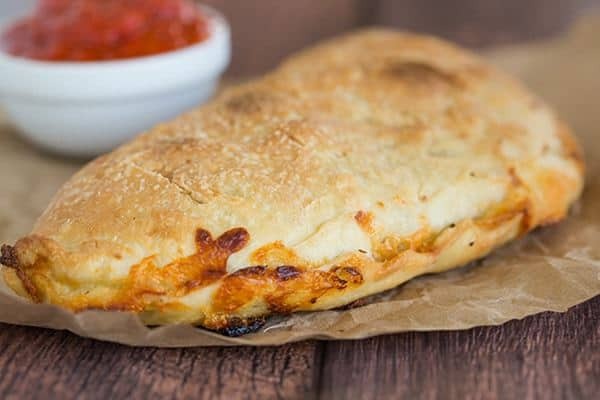 Your Calzone recipe is a huge hit with the family! Everyone LOVED them! I make the calzone crust recipe in my bread maker on the dough cycle. This crust has become my go to pizza crust recipe. It’s fantastic! Thank you so very much! These look amazing. I love calzones but I’ve never attempted to make them. You’ve inspired me to try. They look delicious. Turned out great!! The hubby doesn’t like ricotta, so I left it out. Made a variety of fillings, so had different combos with pepperoni, sauted mushrooms, peppers, olives, and onions. Thanks for the recipe! We made these for dinner last night… amazing!!! I don’t have a pizza stone – can I just bake these on a regular cookie sheet in the oven? Hi Amy, You can, you just won’t get that super crisp bottom crust that you get with a pizza stone. I love the idea of making individual fillings for each of the family. Why have I never thought of that!? They look delicious. It makes me hungry right now! Have you assembled and froze these? Any tips? I have another question. 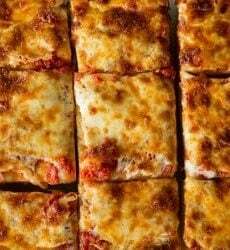 Do they have panzrerottis in Pittsburgh or is that a south Jersey/Philly thing. I think they might be a deep fried calzone. Did you ever have one? Hi Lori, I’ve never heard of panzerottis, but I’ve seen deep fried calzones on some menus. I’ve not tried them. These look amazing. What bread flour did you use….King Arthur? A few weeks back you used 00 for a pizza dough which is on my list. do you think that dough would work too. Hi Lori, I used King Arthur bread flour for this recipe. I did also make calzones with 00 flour – that was amazing too! A thinner crust, for sure, but great, great taste. These look wonderful! Is it possible to halve the dough recipe? Hi Mitzi, I haven’t done it, but I think it would be fine! These look delicious and I can’t wait to try them…but I’m also commenting to say that you should definitely get on Netflix and watch Parks & Recreation start to finish. Calzones are a bit of a (hysterical) running joke in that show! I have never attempted anything pizza related. But this recipe is an encouragement to do so. Boy! do these calzones and the filling combinations sound delicious. I really enjoyed going back through the years of your blog via the links you placed. And as a side . . . I’m not sure what is going on with our Pens . . . too many penalties. Hoping that Letang is ok too. Good thing the season is young and that it’s long. These look delicious. Can’t wait to try your recipe! In Buffalo, Calzones are sometimes called Pods. And Pods are DELICIOUS!!! It’s just this one restaurant but sometimes we indulge. These look scrumptious and there’s lots of yummy variations. I can’t stand tomato sauce so I always got a calzone when we stopped for pizza at the mall or went out for it. Such a easy way to keep everyone happy. These look incredible.